One week has passed since the release of my very first ebook. What was once a dream is now a reality! I would like to thank the individuals who purchased their respective copies. A great shout out to all of you. I have also been receiving positive and great feedback from them. So why won’t you also grab a copy in order to know why. Perhaps let me persuade you even more as to why your 150 is worth it for this ebook. Some of the items here were feedback of my ebook readers. And my oh my, I collected quite a lot, 13 at that. 1. The increment table. There’s more than the usual table we have. This includes the other variations too. Plus, you can even let a kid do the challenge. Not only will the kid get money in the end but he or she will also realize the value of savings. 2. The history. The 52 weeks money challenge has a healthy history and you would be surprise as to where it all started including the one who created it. 3. The foreword. The foreword is provided by one great mentor Sir Burn Gutierrez of Angat Pilipinas. He has been instrumental to my financial advocacy journey and he opened doors and windows of opportunities for me. Even more, the foreword is full of humour something that only Sir Burn can do. And he created it all the way from Saudi. Thank you Sir Burn. 4. The math. 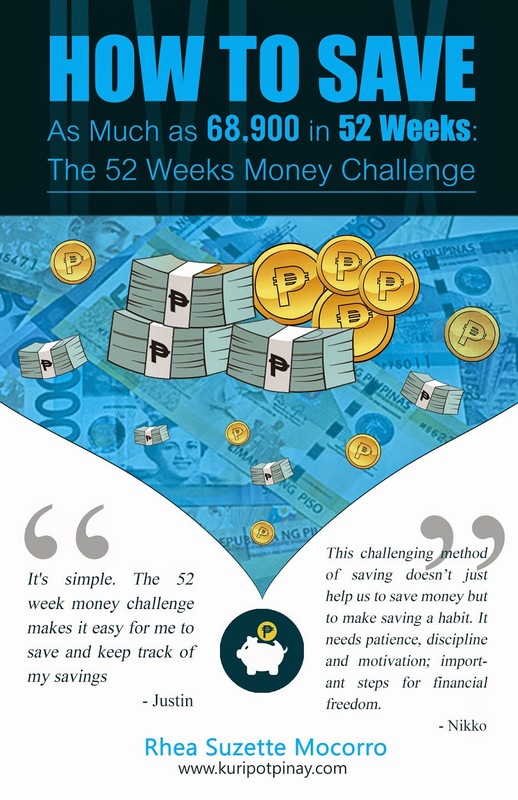 So you think the 52 weeks money challenge is simple? Better think again. For math lovers and haters, there’s a special section on the underlying mathematics and formula behind the challenge. Let me stress it again, mathematics and formula. See, this will not only let you save a lot of money but will also let you appreciate mathematics. 5. The helpful tips. So you think you can’t do the challenge because of the trials you anticipate? Perhaps let the ebook help you out. There’s an exclusive chapter on the trials that you might face while doing it hence we also have answers on how you can overcome it. 6. The pages. It is 85 pages short so you can be able to read it in a jiffy. Even more, you can finish it in a few hours. Trust me, it won’t take much of your precious time. 7. The price. Imagine at 150 you can be able to gain information as to how to save as much as 68,900! Now I must say that’s one great bargain. So why won’t you spend your 150 to something that can yield to greater results. And this book can deliver just that. 8. The pig. There’s a pig in the ebook. Trust me there is. 9. The preface. This particular page is done by the second person whom I thank in my acknowledgment section. Find out who he is and how informative the preface section is. 10. The reflections. There are specific chapters that have questions for reflection purposes. I suggest before you continue in the next chapter, be honest in answering those questions. The questions are also helpful in going further with the challenge. Plus, it will make you realize certain aspects in your financial life. 11. The suggestions. There’s a chapter dedicated in making the challenge more fun and easier. Plus, I have also shared certain tools that will make the challenge a walk in the park. 12. The reflection. I shared here the things I learned while doing the 52 Weeks Money Challenge. I finished it this month and I must say it is one of the most fruitful journeys ever. And I too would want you to experience that more than saving that much amount. There are great lessons that I imparted in this chapter that I want to share with you. 13. The lifestyle. Savings should not be within the context of the challenge. It must be a habit that must be beyond it. And I want that every reader would realize that. Save because you have to not because the challenge tells you. Pay yourself first and save, save, save. These are just the awesome things you can duly look forward while reading and after reading the 52 Weeks Money Challenge ebook. I even made the payment mode easier as you can duly deposit the amount in my BDO Account. Just message me should you want to get my account number. This is definitely something to get not only for yourself but also for your loved ones. Plus, this can be a gift too. As an added bonus, I will be giving out discounts for my second ebook! Yes, I am in the process of writing my second ebook. So to those who purchased this ebook and will purchase this ebook, I will surprise you with your discount soon! Thank you so much for the undying support! Kuripot Pinay will not thrive without it. For your financial journey and success!